Complete TV series of the Hammer show! Large VHS box set. Stars Stephen Forsyth as a psychopath who enjoys hacking up young brides. But his own is back from the grave to teach him a lesson. Directed by Mario Bava. Widescreen edition. The Range Busters appear in this weird western mystery. The head bad guy is none other than Glenn Strange who played the Frankenstein Monster in HOUSE OF FRANKENSTEIN, HOUSE OF DRACULA and ABBOTT AND COSTELLO MEET FRANKENSTEIN. Strange and his gang are trying to scare away inheritors. Absolutely excellent documentary on the life and films of "bad-movie" director Ed Wood. Interviews with EVERYONE from Bela Lugosi Jr. to the chiropractor from PLAN NINE FROM OUTER SPACE to Conrad Brooks and Dolores Fuller. Recommended! Three teenagers take a tour of a "haunted castle." They decide to sneak away from their tour guide and hide in the castle till after closing hours....and, see if there are really ghosts. They're not disappointed. Herman Cohen produced (I WAS A TEENAGE WEREWOLF). The granddaddy sword and sandal fantasy-adventure with Steve Reeves. A huge compilation of weird theater and drive-in promotional films all on one tape. Lots of theater "Spook Show" promos, promo trailers for I WAS A TEENAGE WEREWOLF, INVASION OF THE SAUCER MEN and more! You'll also see intermission films used for drive-ins, snack bar ads. Radiation has done it again! Darn the luck. Robert Clarke stars as a man gets an overdose of radiation. Then when exposed to the sun's rays, he turns into a 6 foot lizard man...scales and teeth. A reptilian-werewolf of sorts. Fun stuff! Country singers and a "country comedian" (can you take him?!) end up in a haunted house after car trouble. Lon Chaney Jr. and John Carradine are lurking about as well as a mad scientist. Whew wheee. You're strong enough...you can take it, Lon and John did! Rare silent film featuring the Ruler of Magic -- The Scarecrow, with Dorothy, The Tin Man and the Cowardly Lion. There's trouble brewing with the Wicked Witch! Produced and directed by the writer of the classic children's fantasies: Frank Baum. Edmond O'Brien in the horrifying film noir classic. Directed by Ida Lupino...this version comes digitally direct from the director's 35mm print. Two men on a fishing outing see a hitch-hiker...they should never have picked him up! Stars Jack Holt, Tristram Coffin, Evelyn Brent and John Ward. Tough secret service guys, tough criminals and tough women. This is the epitome of the rough Hollywood crime movie serials of the forties! The complete 15 chapter serial. 2 Tape Set. Tod Slaughter is back as an evil, fruity gang leader. He's a hooded villain that goes by "The Snake." British private detective Sexton Blake (A Sherlock Holmes knock-off living at Baker Street), is out to trap this maniacal killer called "The Snake." A really cool movie with a prehistoric demonic beast. The beast is being shipped via a train with cargo in a giant coffin sized box. It escapes doing very nasty things to people. Part raging monster movie, part "Invasion of the Body Snatchers," part "Murder on the Orient Express!" A real winner in terror and fright. A top-flight horror with a low budget. Effective chills with Christopher Lee in the cast. A hitchhiker scene that you won't forget. A young woman researches witchcraft in a small New England town full of fog.... and witches. 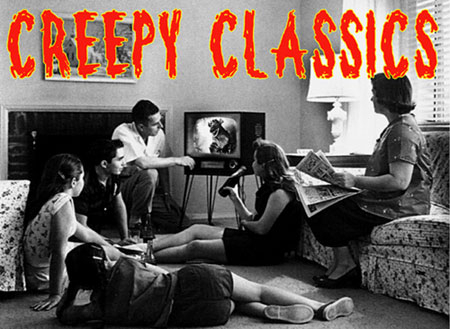 A classic documentary of horror films. Narrated by Jose Ferrer. Michael Gough stars in the tale of horrible, but creative, killings. A sub-plot involves a Jekyll-Hyde type monster. This is the movie that features the spring-loaded binoculars that have spikes in them -- ouch! Standard screen version. Paul Naschy returns from the grave (he was beheaded!). Residing over a mysterious castle, he torments visitors. Spanish horror in English. Michael Gough stars in the tale of horrible, but creative, killings. A sub-plot involves a Jekyll-Hyde type monster. This is the movie that features the spring-loaded binoculars that have spikes in them -- ouch! Widescreen version. AKA: THE WIZARD OF MARS. Stars John Carradine. A bizarre, low-budget mix of the Oz fables and cheezy sixties vogue. A group of astronauts land on Mars to discover large worms and a weird city ruled by The Wizard of Mars (Carradine). Campy fun. Elke Sommer, Telly Savalas, Robert Alda. Directed by Mario Bava. Elke finds herself in an eerie mansion filled with weird characters (including Savalas as a butler who resembles a painting of the devil) and putrefying corpses. Alda is the priest who tries to excorcise her. Rated "R". Color. Boris is back! Boris is the mad doctor masquerading as a carnival shuckster (he had his hunchback kill George Zucco, the real carnival guy). It's a carnival of horrors with the real Count Dracula. He happens on the Frankenstein monster and The Wolf Man (Chaney) along the road to ruin! 46 Classic Hammer Film trailers. All the classics from Hammer films. Included: HORROR OF FRANKENSTEIN, CURSE OF FRANKENSTEIN, NIGHT CREATURES, THE MUMMY, HORROR OF DRACULA, VAMPIRE CIRCUS, TWINS OF EVIL, CURSE OF THE WEREWOLF and many, many more! Stars John Carradine, John Ireland and Faith Domergue. A movie shooting on location at a "real" haunted house find out why it's a real haunted house. Carradine plays the crusty old caretaking with the name, get this -- Edgar Price (heh!). Plays like a creepy Agatha Christie mystery. The Brattling family curse brings back from the dead a phantom. Murder sweeps the old estate at night. Stars Mark Burns and Sally Anne Feld. The film that catapulted Vincent Price into a full-fledged horror star. Price is a sculptor that is left for dead in his burning wax museum. Hideously scarred and insane, he returns with a new type of sculpting...heh, heh. Vincent Price as a millionaire who has a Halloween party! He invites people he doesn't know to spend a night in a haunted house. He awards a cash prize for anyone who can make it through. Elisha Cook Jr. as a nervous wreck is wonderful. One of director William Castle's absolute best! HOUSE ON SKULL MOUNTAIN has heirs to a large old estate return to the mansion to find ancient curses and death. Stars Peter Cushing, Christopher Lee and Ingrid Pitt. Investigations into a house with many murders in its past lead to a series of creeped-out stories. Stories of possession, witches, voodoo, insanity leading to gruesome waxworks and vampirism! If you know about the history of classic make-up artist Jack Pierce...this could almost be his story! A great make-up man is kicked out of his studio. In this guy's case, though, he goes nuts and creates real monsters utilizing his TEENAGE FRANKENSTEIN and TEENAGE WEREWOLF make-ups! Stars Dee Wallace, Patrick MacNee, Dennis Dugan, Kevin McCarthy, John Carradine and Slim Pickens. All star cast inhabits a colony of werewolves! Dee Wallace goes on Holiday to the wrong location....a pack of werewolves. Time to find a new travel agent. Also known as DARK EYES OF LONDON, this is a dark Lugosi classic. He is truly evil in a dual role as an insurance salesman and proprietor of a school for the blind. Really gruesome for its time! Made in England. Quasimodo, the bell-ringer of Notre Dame, goes through trials and tribulations. Lon Chaney Sr. in one of his best roles...and the sets Universal built are still breathtaking. Oh, Esmeralda. The silent classic. The long-sought after version of the Victor Hugo story. A french production with the terrific Anthony Quinn and Gina Lollobrigida. In color with the Quasimodo tale interwoven with some sub-plot of alchemy and torture chambers. A truly touching ending.